microSD is a type of removable flash memory card used for storing information. SD is an abbreviation of Secure Digital, and microSD cards are sometimes referred to as µSD or uSD. The cards are used in mobile phones and other mobile devices. It is the smallest memory card that can be bought; at 15 mm × 11 mm × 1 mm (about the size of a fingernail), it is about a quarter of the size of a normal-sized SD card. 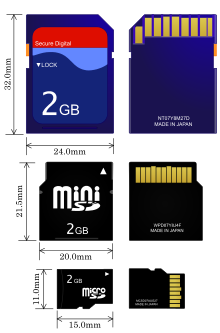 There are adapters that make the small microSD able to fit in devices that have slots for standard SD, miniSD, Memory Stick Duo card, and even USB. But, not all of the different cards can work together. Many microSD cards are sold with a standard SD adapter, so that people can use them in devices that take standard SD but not microSD cards. MicroSDHC format is a newer version of the MicroSD which is not backwards compatible. Some older devices cannot use the newer format, although third party firmware is available for some devices. The microSD format was made by the company SanDisk. It was first called T-Flash, and then TransFlash, before being named microSD when it started to be used by the SD Card Association (SDA). Other flash card formats approved by the SDA include miniSD and standard SD card. The SDA announced the microSD format at CTIA Wireless 2005 on March 14, 2005, and the final microSD details were announced on July 13, 2005. When they were first sold, the microSD format was sold in sizes of 32, 64, and 128 MB. SanDisk made a 4 GB microSD card on July 2006, at first costing $99 (USD). Since then, the prices for flash memory devices have become much lower. At the time of April 2009, the same 4 GB card could be bought for as low as $12 (USD) at department stores, and by May 2009, for as low as $6 (USD) at online electronics stores. In January 2010, a 16 GB micro SD card class 2 cost about $40 (USD), and a 4 GB class 2 micro SD card about $8 (USD). Several manufacturers make microSD cards and they consume different amounts of electrical power. Most are in the range of 0-100 mA at a supply voltage of 3.3 V. TwinMos technologies says that the cards carry a maximum of 45 mA during transfer. Toshiba lists 80-100 mA. ↑ "SD Cards and Writing Images". ↑ "microSD Card". SD Card Association. Retrieved 2008-09-13. ↑ "microSD definition (Phone Scoop)". www.phonescoop.com. ↑ "MajorChanges < Main < Wiki". www.rockbox.org. ↑ 5.0 5.1 "Integral Memory's new 512GB microSD card is the biggest microSD card yet". This page was last changed on 11 April 2019, at 20:34.